Safari Adventures does not want to miss out on the festive season so we have something very special for all of you to come and see! From the middle of December we will have two very rare white lion cubs (yes, real white lions) for you to see and interact and walk with. We also have accompanying them three normal savannah lions that are adorable and you will all fall in love with. Safari Adventures will be the only place in the world that you can walk with white lions. In December 2010, you will be able to interact with the 2 white lions, 1 male and 1 female who have travelled all the way from South Africa to meet you. 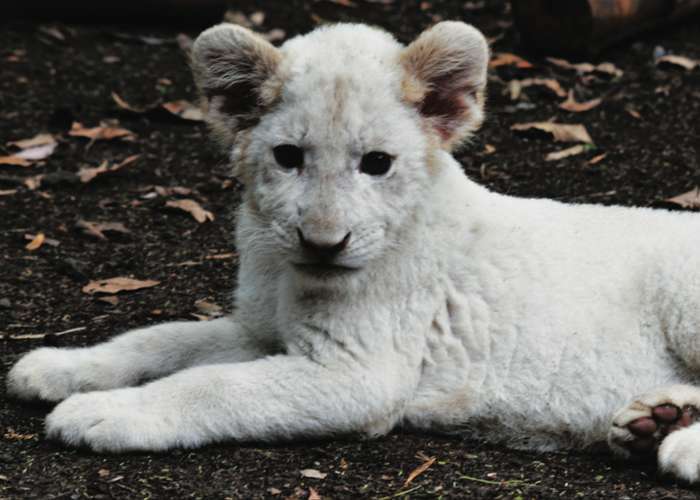 We are excited to welcome on board these 2 rare species of white lion cubs. Being around them is a magical moment that you definitely need to experience. White lions are not albinos, but a genetic rarity unique to one endemic region on the globe: the Timbavati region in South Africa. The colour pf their fur is the result of a recessive gene known as the colour inhibitor or chinchilla. Their fur colour thus varies from blonde through to near white depending on the pigmentation of the lion. Their eyes can vary from normal hazel to golden, blue-gray and green-gray. The earliest recorded sightings of white lions in the Timbavati region was in 1938. However, the oral records of African elders indicate that these unique animals survived in the region for many centuries. At Safari Adventures you will be able to interact with them on a personal level. Or if you care to go for a walk in the wild, then join a small group of people and walk with them side by side in an amazing wild life setting. Walking with the lions is an experience that is a dream come true. Their fur is soft and warm to the touch and their playfulness is a joy to watch. The male is named Mulatsi, meaning the lucky one, and the female Shangani, the name of a tribe in Zimbabwe who are renowned hunters. They have a curious nature and are very friendly. They are taught how to interact with people and are used to being stroked and patted which they gladly welcome. The three savannah lionesses are Pexula, Sinanga and Mampara. All these lions will join Bowzer and Ginger to make a new pride for Safari Adventures. They are only a limited amount of white lions in the world so we at Safari Adventures feel privileged to be able to show you these magnificent very rare white lions. If you have flown several hours to be in Mauritius, Safari Adventures welcomes you to come and enjoy an unforgettable experience to see, touch and walk with the kings of the jungle. Sign up for the latest Safari Adventure offers and news. Disclaimer: Please note that Safari Adventures does not endorse handling or interfering with big cats from the wild. We do not support canned lion hunting. © 2017 Safari Adventures. All Rights Reserved.